On the second day of her second patrol in the Sea of Marmora submarine E11 sinks the Turkish gunboat Berki Satvet. During night at the same time as the British IX Corps begins landing at Suvla to the north a breakout from the Anzac sector is made by units of the New Zealand and Australian Division under the command of General Alexander Godley. Two columns of troops are directed at two peaks of the dominating ridge which are expected to be captured by dawn tomorrow. Both columns are preceded by a covering force to clear the Turkish outposts and protect the flanks of the main assaulting force. The left, or northern, column of the Australian 4th Infantry Brigade and the 29th Indian Brigade are heading for Hill 971, the highest point on the Sari Bair range. They have the furthest to travel over completely unfamiliar terrain and never get close to their objective. The right, or southern, column is heading for Chunuk Bair. Though lower than Hill 971, this peak overlooks the north of the Anzac perimeter and is used as a base for an artillery battery. The main Sari Bair ridge extends from Chunuk Bair down into the Anzac sector via Battleship Hill and Baby 700. From Baby 700 the ridge branches towards the beach via the Nek and south to Lone Pine via the line of tenuous Anzac positions known as Quinn’s, Courtney’s and Steele’s Posts. The capture of Chunuk Bair would provide considerable relief to the Anzac sector. The approach to the peak is made along Rhododendron Spur which runs from the beach to the peak of Chunuk Bair. The Turks have outposts along the spur at the Table Top, Destroyer Hill and nearest the beach at Old No. 3 Outpost. There is also a Turkish outpost on Bauchop’s Hill to the north. All these outposts have to be cleared by the covering force, the four regiments of the New Zealand Mounted Rifles Brigade, before the main assault column can proceed up the spur to the summit. The Auckland regiment clears Old No. 3 Outpost and the Wellington regiment takes Destroyer Hill and the Table Top. The Otago and Canterbury regiments capture Bauchop’s Hill, named after the Otago regiment’s commander, Lieutenant Colonel Arthur Bauchop who will die of wounds received during the attack. In all the New Zealanders lose about 100 men in clearing the outposts and while their efforts are successful, the plan is now running two hours behind schedule, making it difficult to reach the summit before first light. The main force of the right column is the New Zealand Infantry Brigade under the command of Brigadier General Francis Johnston. The Brigade’s four battalions, reduced by sickness and battle, mustered about 2,800 men.. The advance is initially made up the valleys, on either side of Rhododendron Spur and once past the Table Top, the New Zealanders climb on to the ridge, leaving about 1,000 yards to travel to the summit. 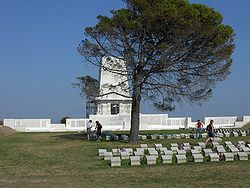 As a diversion to the main assaults against the Sari Bair peaks of Chunuk Bair and Hill 971 the whistles blow for an assault on Lone Pine at 17:30 and the Australians of the 1st Infantry Brigade emerge yelling and shouting from underground tunnels which have been dug 50 yards beyond their own front. They have 100 yards to dash and when they reach the Turkish front they discover the Turks have roofed over most of their advanced trenches with pine logs. Some Australians drop their rifles and try to pry the logs away. Others fire between the logs into the Turks below, while still others dash beyond to the communications trenches and attack the enemy rear. A fierce close quarters battle rages as the Australians drop into the darkened passages below while the Turks, who have been sheltered from the artillery bombardment that preceded the attack, attempt to emerge from their tunnels. The Australians fight mainly with rifle and bayonet and sometimes with their hands. The preliminary attack has killed or wounded many of the Turks and the rest are either killed, driven out or captured by the Australians. By 18:00, Lone Pine is in Australians hands. Many hours of attack and counterattack follow with the Turks eventually throwing their entire reserve into the battle. The enemy uses close-in bomb fighting in their efforts to retake the lost positions. Many Australians catch bombs and throw them back, an audacious act, which ends when the Turks shorten the fuses on their bombs. This results in quite a few Australians having their hands and arms blow off. The 32nd and 33rd Brigades of the 11th Division began to come ashore at “B Beach” Suvla Bay south of Nibrunesi Point shortly before 22:00. In the first action fought by a New Army unit, two companies from the 6th Yorkshire Regiment drive the Turkish defenders off the small hill of Lala Baba which overlooks the beach. It is an inauspicious start as all but two of the Yorkshire’s officers become casualties as do one third of the men. Shortly afterwards the 34th Brigade attempts to land at “A Beach” within Suvla Bay but the landing goes awry from the start. The destroyers conveying the brigade anchor 1,000 yards too far south, facing shoal water and on the wrong side of the channel that drained the salt lake into the bay. Two lighters ground on reefs and the men have to wade ashore submerged up to their necks. The Manchester Regiment, having come ashore from the destroyer HMS Grampus has the greatest success of the landing, managing to find its way to the Kiretch Tepe ridge and fight its way some distance along it to the east with the loss of 200 casualties. Elsewhere the landing is in chaos, having been made in the dark which results in confusion with units becoming mixed and officers unable to locate their position or their objectives. Later, when the moon rises, the British troops become targets for Turkish snipers. Attempts to capture Hill 10 fail because no one in the field knows where Hill 10 is. Shortly after dawn it is found and taken, the Turkish rearguard having withdrawn during the night. It is agreed on this day that the Indian Expeditionary Force “D”, which in its advance inland has now reached Nasiriya, should advance on Kut. Captain Edwin Gerald Venning (Suffolk Regiment) is killed by a sniper shot to the neck while observing the German lines from his own trench at age 32. The regimental history stated “All ranks deplored the loss of a very valuable, gallant and popular officer. His body was conveyed to Locre the same evening and buried in the village churchyard.” He is the son of the late Reverend Edwin James Venning, British Chaplain at Cassel, Germany and is a well known classical actor. Captain Harry Burnett Stevenson (Rajput Light Infantry) is killed on Gallipoli at age 33. He is a Rosslyn Park Rugby footballer. Captain Nicolas Melville Gepp (King’s Own Yorkshire Light Infantry) is killed on Hill 12 Gallipoli. He is a veteran of the South African War and the son of the Reverend Nicolas Parker Gepp Canon of Ely and Rector of Witchingham. Captain Basil Stewart Parker (Hampshire Regiment) is killed in action on Gallipoli at age 37. He is the son of the Reverend George Parker. Captain Alec Vaughan Thomas (East Surrey Regiment attached Hampshire Regiment) is killed at age 22. His brother will be killed one day short of two years from today. Lieutenant Lancelot Botry Pigott (Hampshire Regiment) is killed in action at age 26 on Gallipoli. He is the son of the Reverend Eversfield Botry Pigott Rector of Ellisfield. Lieutenant Howard Field (Worcestershire Regiment) is killed on Gallipoli. His brother was killed just over two months earlier. Lieutenant Amyas Leigh Goldie (Gloucestershire Regiment attached Worcestershire Regiment) is killed at age 36. His brother was killed in March of this year. Second Lieutenant Everard Digges La Touche (Australian Infantry) dies of wounds received in the intestine at Lone Pine at age 32. He is a Clerk in the Holy Orders (Clergyman) but had been unable to obtain a position as Chaplain so he enlisted as a private in the Infantry. His brother will be killed in action in September 1915. He was the youngest ever to earn a Letters Degree from Trinity College, Dublin. Second Lieutenant Alexander John Robertson (Australian Infantry) is killed at age 28. He played 10 Australian Rules Football games for Melbourne University in 1909. Second Lieutenant Charles Hobson Whidborne (Australian Infantry) is killed at age 33 as the first of three sons of the Reverend George Ferris Whidborne who are killed in the war. Second Lieutenant Christopher Moor (Hampshire Regiment) is killed on Lone Pine. He is the son of the Reverend Dr. Charles Moor Vicar of Barton on Humber & Canon of Lincoln. Second Lieutenant Basil Stewart Parker (Hampshire Regiment) is killed at age 37. He is the son of the Reverend George Parker Rector of Quainton. Second Lieutenant Gavin Campbell Arbuthnot (North Staffordshire Regiment) is killed on Gallipoli at age 22. He is the son of the Reverend William Arbuthnot, Vicar of Lea Marston Warks. Sergeant Robert Anthony Fleming (Canterbury Mounted Rifles) is killed at age 24. His ancestors claimed to have saved the flag bearing the legend “For Christ and Covenant” from the field of Bothwell Bridge in 1688. Lance Corporal Alleyne Gordon Webber (Otago Mounted Rifles) is killed at age 27. His brother will be killed in February 1917 and they are nephews of the head master of the South School Inverecagill. Trooper Stanley Maris Clark (Auckland Mounted Rifles) is killed at age 35. He is a keen football player and well known in rowing circles. Brothers and Privates Harold Benjamin and Edward John Victor Hennell (Australian Infantry) are killed together in the attack. Trooper Alexander Forbes Hogarth (Australian Light Horse) dies of wounds in Egypt at age 27. He has two brothers who will die in the Great War, the first next year the second in March 1918. Private Harold Forbes Clarke Winch (Australian Infantry) is killed at age 19. He is the son of the Reverend George Thomas Winch Vicar of OF Brompton. Private Alan Gordon Till (Australian Infantry) is killed. His son will lose his life serving in the Royal Air Force in June 1944. Private William Hall (Hampshire Regiment) is killed on Gallipoli. He is a member of the Aylesbury Football Club. Private Frederick Henry Wright (Worcestershire Regiment) is killed. His brother will die of pneumonia in December 1917. Private John Henry Tromans (Worcestershire Regiment) is killed in action on Gallipoli. His brother will be killed in January 1916 and his wife’s brother will also be killed in action. Private William John Methven (Hampshire Regiment) is killed. His brother will die on service in Mesopotamia in July 1919. Driver Robert Lynn (Royal Field Artillery) is the first of four brothers who will lose their lives as a result of Great War service when he is killed at age 30. Private Charles Heaton (Manchester Regiment) is killed in action at age 27 one month after his brother was also killed on Gallipoli. Two hundred forty one members of the Essex Regiment are killed at Achi Baba, Gallipoli. Lieutenant John Charles Gardom (Essex Regiment) is killed at age 31. He is a Gold Medal Skater of the National Skating Association in 1911. Second Lieutenant Richard George Gabb (Essex Regiment) is killed at age 21. His brother will be killed in December 1916. Lance Corporal Arthur Roper (Essex Regiment) is killed at age 24 and his brother Private Frederick Roper (Essex Regiment) are killed together. Private Jesse Freshwater (Essex Regiment) is killed. His brother will be killed in December 1917. Privates and brothers Richard James (age 19) and Frederick Thomas Whall (age 23) are also killed.